This boss room’s exit method is a bit antiquated – like A Guy on the previous page pointed out, it was built before glowing blue warp patches became the norm! I edited the previous comic a bit, thanks to you guys’ suggestions. And the one before it. Betcha didn’t notice that Cyril’s goatee went mysteriously missing in one panel… but I did. Well, it’s back now! I’ve said it several times already, but it’s always a good comic when Skarva gets to play cool! I am surprised that floats, what with all that gold and silver. Maybe it is magical rock that is actually super buoyant? Those guys really want to fight. I wondered about that myself, I think, but between magic and the possibility of entrapped, low-density gas, it doesn’t seem implausible. Just think displacement. It could work. It could, I think, but I suspect that it would depend significantly on the density of the solid material (including the objects on top of the platform–all that dense gold, for example), the amount of space given over to gas, and the density of the gas. I’ve been reading a Fafhrd and the Gray Mouser collection of late, and one of the regions mentioned in that is the “Sinking Land”, a large chunk of ground that is described as rising from and falling back beneath a body of water on pretty much this principle: gas builds up beneath it, causing it to rise, then escapes once it’s at the surface, causing it to fall again beneath the water–complete with rather alarming rocking as the gas escapes from one side or the other. Not just that, think of buoyancy. A cargo ship can get a deadweight of around 100,000 tons and it is massive. Basically, if it is wide enough, it could float. The density is only part of buoyancy. Look at us, just being all scientific stuff. But recall that a cargo ship will nevertheless contain a lot of matter rather less dense than water, meaning that its average density is lower than water. Indeed, having just gone back to Wikipedia to check my thoughts and refresh myself on the subject, bouyancy is, I believe, related to the average density of the submerged portion of the object in the water. Intuitively, I’m not sure of whether flattening alone would enable flotation. Thaumaturge and Falx, scientists extraordinare! On the downside, I imagine that those on the platform and a good portion of the treasure are now pretty soaked from the splash of that thing hitting the water. 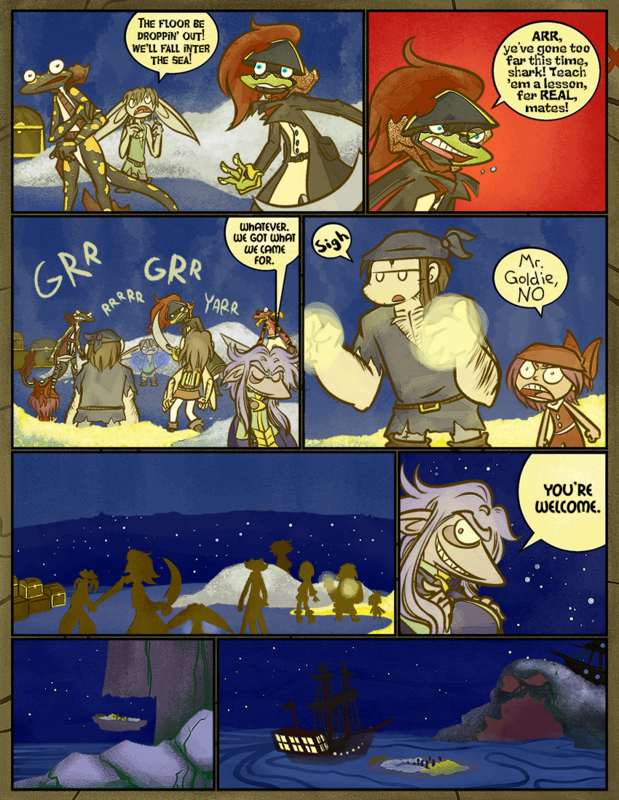 Those last four panels are all rather pretty, the last two especially. LOL! That’ll learn those guys to let free giant octopi! Oh… wait, Now I love Lord Skarva!!!! So clever, I love him! !